Here's yet another new recipe made during Cookbook Exploitation Month! Today's dish is from the Better Homes & Gardens Cookbook, an old warhorse in our kitchen, and it was another successful and easy-to-make recipe. I will concede, however, that it was a bit of what I'd call an ethnic reach for Better Homes. 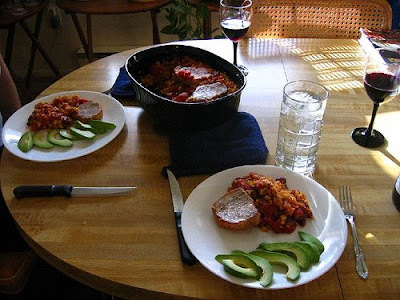 But this recipe was so easy and required so little prep work that I can definitely imagine us making this dish again. And of course it can (and probably should) be modified to be more spicy. We share our suggested modifications below. In a large non-stick pan, brown meat in hot oil for a few minutes on each side. Drain fat. 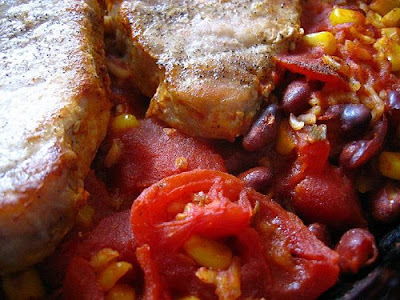 In the same skillet, combine undrained stewed tomatoes, drained corn, drained kidney beans, rice, chili peppers and seasonings (ie, all other ingredients), and bring to a boil. Boil for 1 minute. Transfer tomato mixture into a 7x12 inch pan or a medium sized baking dish (note: a 1.5 quart Corningware casserole dish would be perfect here). Arrange chops on top. Cover with foil and bake at 350F for 30 minutes. Uncover and bake about 10 minutes more or until rice is tender and pork is cooked through. 1) Don't get me wrong, I love this cookbook, and we really liked this recipe. But I can't help myself but chuckle a little bit when Better Homes tries to go ethnic. The authors try hard, they really do. But let face facts: this is just not a Mexican recipe. It's essentially a midwesterner's attempt at a facsimile of a Mexican recipe. If you'd like a slightly more authentic example of Mexican cuisine, I'd encourage you to take a look at my mole sauce recipe, or better still, pork with guajillo chile sauce. 2) Be sure to sear the pork chops using high heat. 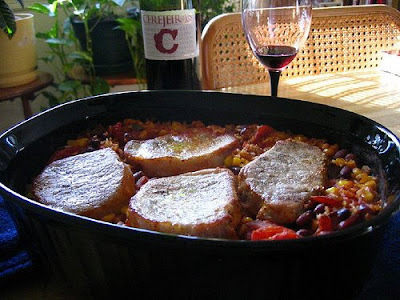 This will help seal in the juices when the chops bake, and it will help prevent dreaded dry pork chop syndrome. a) Instead of "Few dashes Tabasco" we shook a heck of a lot of shakes of Tabasco in there. b) Instead of "One four-ounce can of diced green chile peppers, or 1 teaspoon chili powder" we added two teaspoons of hot cayenne pepper. You could also consider using either fresh or canned jalapenos. 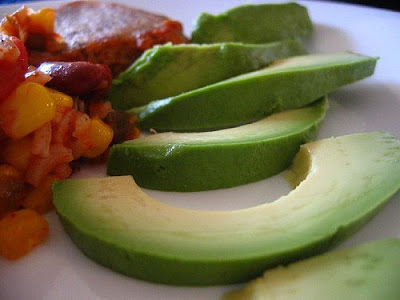 4) And of course, feel free to add an optional avocado on the side--it adds a colorful (and tasty) contrast! Hi Kelly, thanks for your comment. You may be right that the expression "seal in the juices" is more euphemism than fact, but I for one have found it to work for sure with chicken. When I sear it in olive oil at high temperature, it stays much more moist. Maybe it's due to the brief duration of the exposure to heat more than any actual "sealing in" though. Anybody else care to weigh in on this? I don't think that it does seal in juices, but it certainly increases the complexity and depth of flavor. I inherited the BH&G cookbook from my late mother & recently chose this recipe to try. We really liked it. I have pics on my Google+ page.